FACTORY CAB OPTION: Work in comfort from your climate-controlled cab and enjoy more space and panoramic views of your surroundings. The doors open wide for easier entry into and exit from the cab. Comfort is also enhanced through better noise insulation for a quieter interior. The interior includes an ergonomic control layout, storage compartment, cup holder and a pocket for an operator's manual and tool box, all within arm's reach. 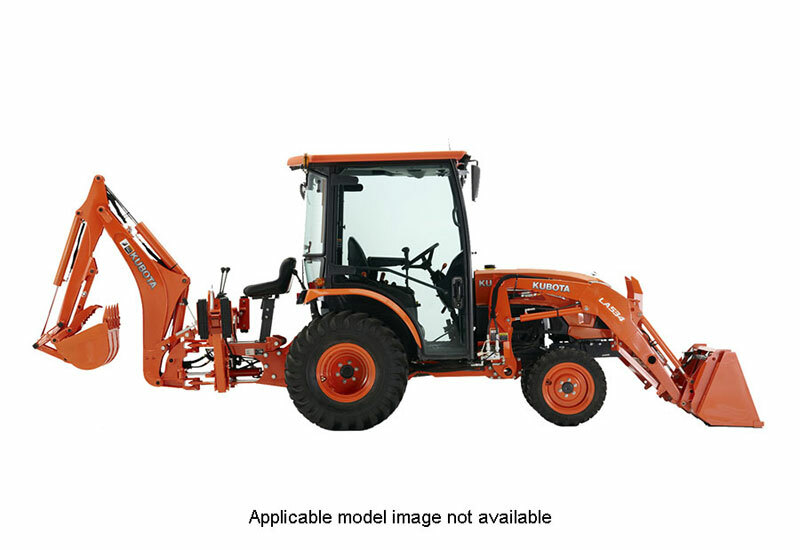 COMPACT TRACTOR, BIG COMFORT: At Kubota, comfort is a top priority. Features: 1. Wide and Flat Operator’s Station – Easy to get on and off with plenty of leg room to increase operator comfort. 2. Modern Dash Panel – Easy-to-read with all the information displayed right in front of the operator. 3. Easy-to-Use Controls – Simple controls that are easy to understand and operate, even for first time users. 4. Kubota Treadle Pedal Design – Effortlessly change speed and direction using Kubota’s forward and reverse treadle pedals. 5. Deluxe High Back Seat with Armrest– Increases operator comfort. 6. Tilt Steering Wheel – Allows you to adjust the steering wheel for maximum comfort. 7. Rubber Floor Mat – Reduces noise and vibration, creating a more comfortable ride while decreasing fatigue. 8. Cab Version – Available with the comfort of a climate controlled cab. 9. 3-Range Hydrostat (HST) Transmission – With an easy-to-use HST paired up with a Kubota 3-range transmission, you’re sure to find the right balance of speed and torque to get your job done quickly and efficiently. 10. Cruise Control – Allows the operator to maintain a constant speed without keeping their foot on the HST pedal. 11. Hydraulic Independent PTO – Easy-to-use, no clutching or stopping. 12. Ready for a Long Day – Standard cup holder, tool box and large fuel tank capacity. COMFORT IS KEY: Comfort is always a top priority with Kubota. The B50 Series has plenty of features to keep you comfortable – no matter how long the job takes. The B50 Series features: 1. Climate Control Cab Models Available. 2. Deluxe Suspension Seat. 3. Wide, Flat Operator Station. 4. Ergonomic Controls. 5. Tilt Steering.